20 month shelf life The EM-02 is a wicking type adhesive. 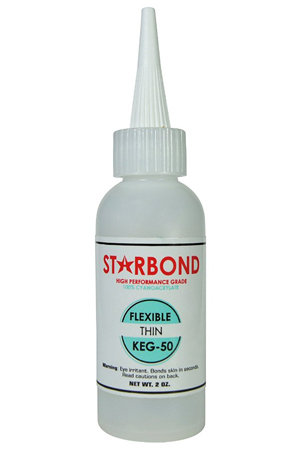 This watery-thin adhesive infiltrates hairline fractures, pores, and narrow slots filling any empty voids. The EM-02 is well suited for porous and fragile material such as soft wood (balsa), ceramics, unpolished rocks and minerals, and fossil bones. For inlay applications, it penetrates and stabilizes the material through capillary action. The EM-02 will immediately soak into a soft, porous object until it is fully saturated with the CA. In such instances, it is advised to use an accelerator to create an instant reaction so full saturation of the object is unnecessary. It is often used as a finish by applying several coats, sanding, and then polishing to a high gloss. Also includes 2 ea. caps and 6 ea. flexable tips. The EM-2000 is known as the "gap filler" adhesive. Its high viscosity allows filling of large voids and gaps. Each drop of EM-2000 remains stationary even when applied on downward sloping surfaces. Curing time is extended to give users longer positioning time for more precise bonding. Depending on the working material, bonding time may exceed more than two minutes. 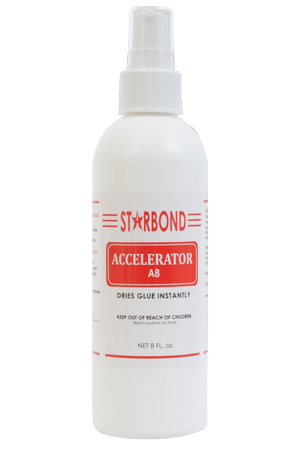 In all such instances, Starbond Accelerator is recommended to speed up bonding time. Quick repairs for auto paint and body. Filling large gaps and holes. Forming unique finishes by carving, sanding, and feathering. 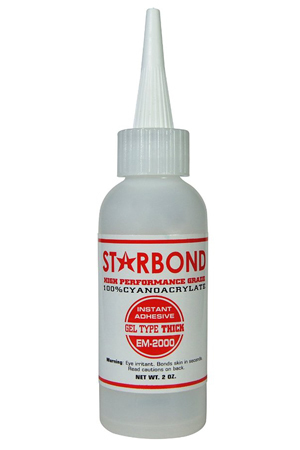 Starbond CA adhesive are 100% cyanacrylate. 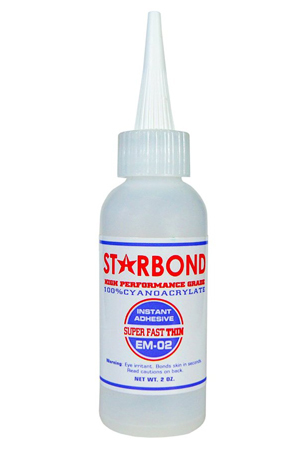 This allows for extremely fast bonding times and a super strong bond on wood materials. 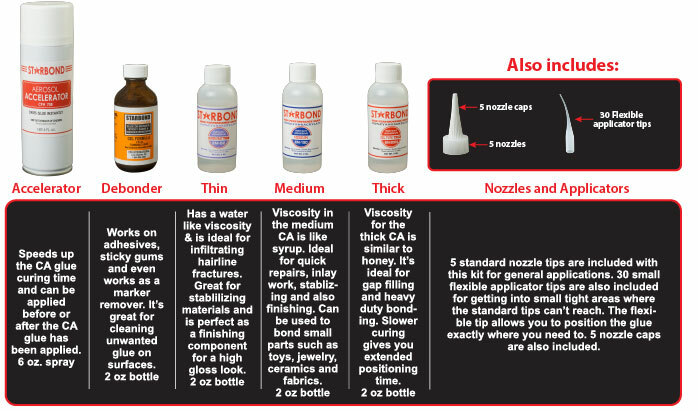 Available in thin, medium and thick viscosity's. 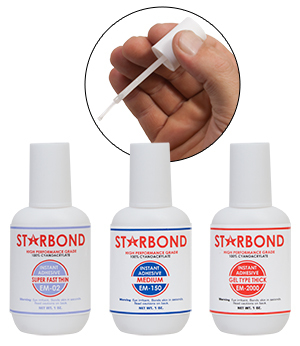 The Starbond CA glue now has a conveniant brush tip lid. Now you can apply the exact amount of glue exactly where you need it. Perfect for many woodworking projects and around the house. 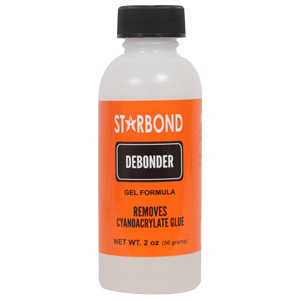 Removes cyandacrylate glue. Just spread on over unwanted glue and wait 5 to 10 minutes and wipe off with cloth. Repeat if neccassary. Always make sure to use in ventilated area and make sure not to contact with eyes or skin. The KEG-50 is a thin CA that adheres well to flexible material. 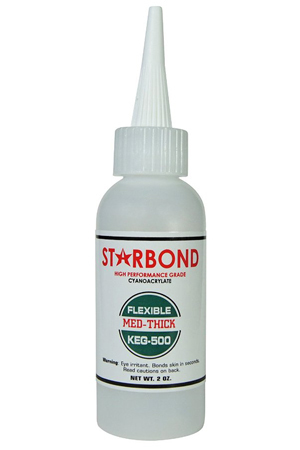 Along with impact and shock absorbance, the adhesive provides users with other favorable qualities. Given its improved flexibility, the KEG-50 retains the ability to be sanded down and polished to a high gloss. When infiltrating fractures, pores, and soft material, the adhesive is able to expand and contract with its surrounding malleable environment, preventing cracking. Forming CA hinges, providing ample flexibility to bond moving parts together. Preventing pen blanks from tearing, cracking or splitting off of tubes when turning. The KEG-500 is a CA that adheres well to flexible material. Along with impact and shock absorbance, the adhesive provides users with other favorable qualities. Given its improved flexibility, the KEG-500 retains the ability to be sanded down and polished to a high gloss. The KEG-500 is four times stronger than standard CA and is well suited for heavy duty bonding, bonding of malleable material and filling voids. KEG-500 also has higher resistance to natural heat and humidity weathering. 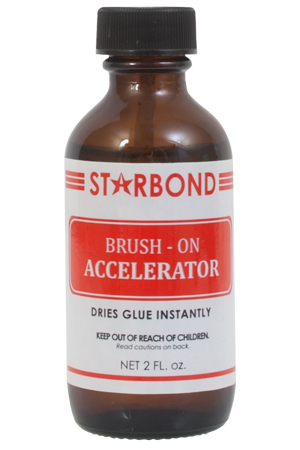 Just load Brush with StarBond Brush-On Accelerator and apply on bonding area prior to applying CA Glue. When bonding, spray glue on one area and apply CA to the opposing area. Position Material together and hold for 20 to 30 seconds. Whe filling cracks or voids apply glue first, then spray accelerator over glue. Glue will cure in 10 to 20 seconds.